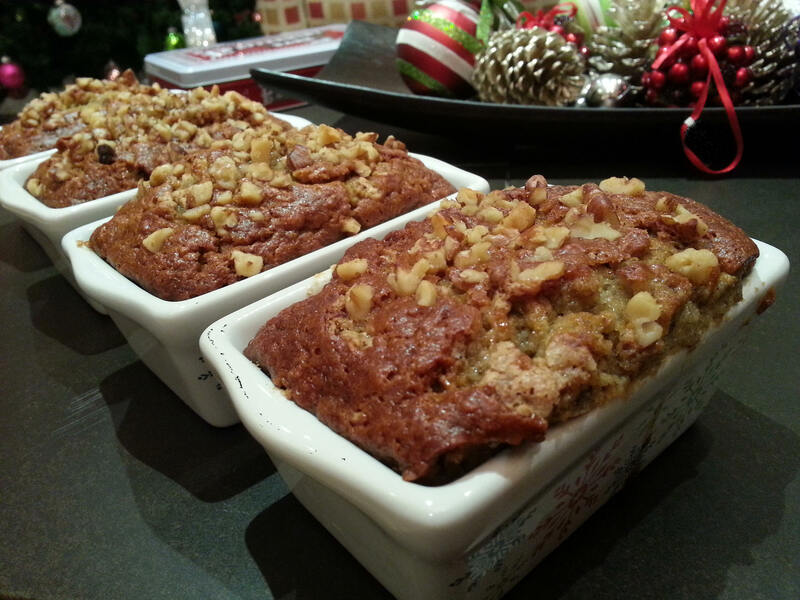 This banana bread recipe comes from the Betty Crocker’s cook book that I bought when I was in college. It is a time-tested recipe that I like to bake for weekend breakfast. The aroma of banana when it is baking the oven is irresistible; the bread is best served warm when the texture is soft and moist. I have tripled the recipe this time and filled 8 small ceramic loaf pans as gifts for the holiday. Grease bottom of a 9x5x3 loaf pan. Sift flour, baking soda, salt, and baking powder together, set aside. Mix sugar and butter in a standing mixer with the paddle attachment. Stir in flour mixture until moistened. Pour into loaf pan and sprinkle nuts on top. Bake until wooden pick inserted in center comes out clean, about one hour. Cool 5 minutes. Loosen sides of loaf from pan, remove bread to cooling rack. Cool completely before slicing, if you can wait that long ….